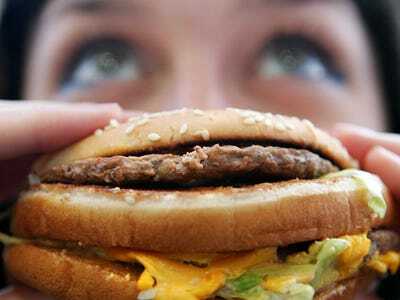 Cate Gillon/Getty ImagesIn this photo illustration a lady eats a beefburger on July 12, 2007 in London, England. Government advisors are considering plans for a fat tax on foods high in fat to try to help tackle the fight against obesity. Add this to the list of potential health reasons to avoid fast food: faecal bacteria. A recent BBC investigation reportedly found traces of the bacteria in samples of iced drinks from Burger King, KFC, and McDonald’s. British investigators tested 10 samples at each of the chains for traces of the microbes. KFC fared the worst, with seven of its samples coming up positive for the bacteria. Burger King tested positive in six samples, and McDonald’s tested positive in three. A spokesperson for McDonald’s told Business Insider that there are currently no specific health standards in place when it comes to ice production — the only regulations that exist are for unfrozen drinking water. “We would therefore welcome the introduction of an agreed standard and would be happy to work with relevant industry bodies,” they said. The findings come just a month after the same investigation team found traces of faecal bacteria in samples of iced drinks from Starbucks and two other popular UK coffee chains. The presence of faecal bacteria — which can cause diarrhoea if ingested — could be a sign that there are nastier germs also present, said Philip Tierno, a microbiologist at New York University. “Where there are faecal bacteria present it is an indicator that there could be other germs that are pathogenic [or illness-causing] like Norovirus or hepatitis A or Salmonella that can make you sick,” Tierno told Business Insider. It also suggests that workers at the chains are not keeping themselves clean and that they “have dirty bare hands,” he said. In response to the reports, KFC has shut down its ice machines at the chains that tested positive and has inspected and cleaned ice machines in all of its other locations across the UK, a spokesperson for the company told Business Insider. “This report is an opportunity for us to emphasise our training procedures and ensure all operations and safety standards are upheld in all Burger King restaurants,” a Burger King representative told Business Insider.